“Sorry, guys,” Carney said, drawing gasps. The “better pizza” was Papa John’s. Though the scene was fictional (the franchisees were actors, and Carney’s words were scripted for a television spot), the sentiment was not. Carney and his brother had sold Pizza Hut to PepsiCo in 1977, with Carney leaving the company in 1980. He had subsequently franchised several Papa John’s locations in the Wichita, Kansas area. Having Carney appear on-camera and pick a side was a way for Papa John’s to announce their candidacy as America’s next great pizza chain—a shot across the bow that would see both sides sue for false advertising, engage in corporate espionage, debate expert testimony on dough quality, and finally petition the Supreme Court for resolution. Not since the days of the Mafia controlling mozzarella distribution would so much sauce be spilled. "How much longer are we going to let them own the quality brand position? How much longer are we going to let them run their false advertising claims?...How much longer are they going to have better service?... How much longer are they going to kick our butts in sales?" Novak, who was president of Pizza Hut's parent company, Tricon, had already launched an attack strategy: internally, it was dubbed Operation Lightning Bolt, a nine-month, $50 million initiative to engineer a better-quality pizza. Toppings were added and ovens re-calibrated for more consistency. In a national ad spot, Novak himself stood on a World War II aircraft carrier and “declared pizza war” on poor quality pizza... and the competition. “I dare you to find a better pizza,” he shouted. Consumers were promised they’d love Pizza Hut’s new taste or they’d eat for free. Local municipal water companies were not pleased; neither was Pizza Hut. But Schnatter wasn’t done. In another ad, an unappetizing shot of congealed, lumpy tomato sauce was identified with the competition. Better ingredients. Better pizza. A print ad listed the “fresh-packed” tomatoes Papa John’s used; Pizza Hut trafficked in “xanthan gum” and “hydrolyzed soy protein.” Better ingredients. Better pizza. Papa John’s spread word of a taste test conducted that showed consumers preferred their pizza, “big time.” Patrons about to enter Pizza Hut restaurants were offered free pies compliments of the competition. When they looked at the box, the mantra was there: Better ingredients. Better pizza. 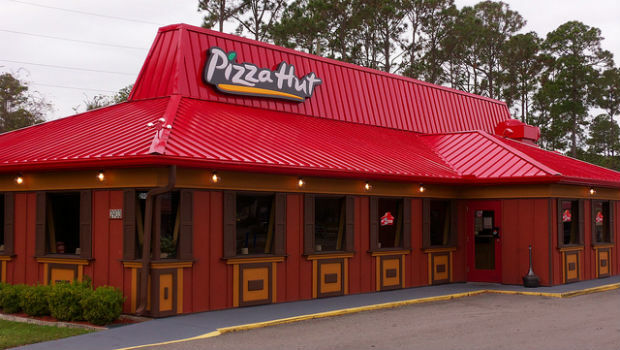 Pizza Hut appealed to the Better Business Bureau’s National Ad Division, arguing the marketing—including the taste test, which hadn't included their signature "Pan" pizza—was deceptive. NAD evaluated Papa John’s and asked them to tweak their tomato paste rant slightly. But the chant continued. Better ingredients. Better pizza. Novak was apoplectic. In May of that year, Papa John’s had seen an 11 percent increase in sales over the same timeframe a year prior; Pizza Hut was down 8 percent. 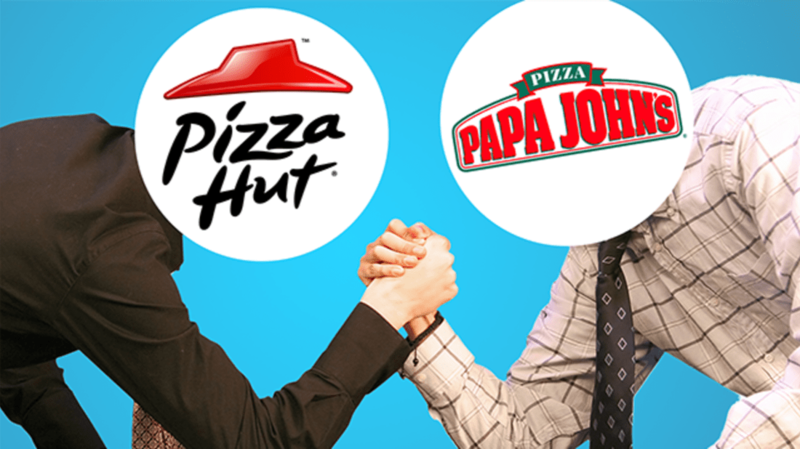 Corporate was handed a new mandate: internally, the campaign was titled “Stoppa the Poppa.” Franchisees were sent vinyl punching bags emblazoned with Papa John’s imagery; Schnatter’s delivery drivers were followed and their license plates jotted down so they could be offered jobs with Pizza Hut. Customers who had just ordered from Papa John's got Pizza Hut coupons dropped at their door. A camera crew set up outside a Papa John’s processing plant, eyeballing it for suspicious behavior. Curiously, Novak and Schnatter only lived a half-mile apart from one another in the same Louisville, Kentucky suburb of Anchorage. They even attended the same church. In 1998, the University of Louisville opened an arena that was christened the Papa John’s Cardinals Stadium because Schnatter had donated $5 million to the school. Better ingredients. Better seats for home games. Pizza Hut decided to take “corrective” action, rolling out a TV spot that may have made advertising history by taking an actual snippet of a recent Papa John’s commercial and using it to damn them. In it, Schnatter brags about using dough that’s been fermenting for just the right amount of time, aging like fine wine. 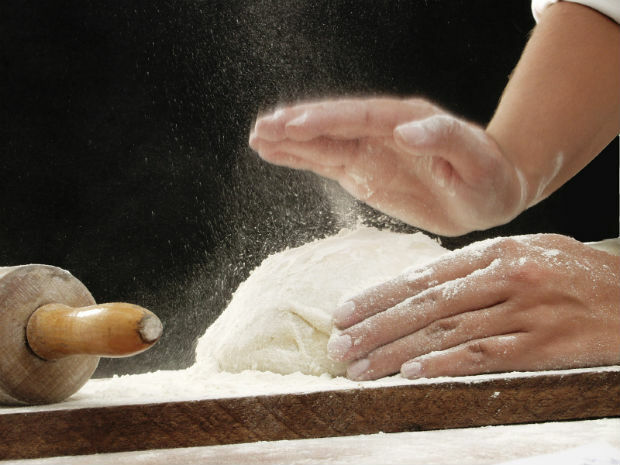 “We never use dough made the same day,” he says. Lacking context, he seems to be “admitting” Papa John’s uses old, stale dough. Papa John’s cried foul. But Pizza Hut wasn’t done. They wanted a jury to decide on the merits of their rival’s slogan. Or, as Novak was alleged to have told a subordinate, he wanted to wipe out that phrase from the millions of boxes and ads across the country. And he almost succeeded. Failing to find satisfaction with the NAD, Pizza Hut sued Papa John’s in Dallas Federal District Court in 1998, claiming false and misleading advertising. The case was heard in October and November of 1999. As would be expected of a courtroom battle between two pizza conglomerates, there was no shortage of surreal testimony. Jon Faubion, Ph.D., a professor at Kansas State University who specializes in baking science, was secured by Pizza Hut as an expert witness in dough-related matters. Faubion explained that the methodology used by both parties—the frozen, tap water-infused dough made by Pizza Hut and the fermented dough favored by Papa John’s—resulted in no taste advantage for either side. (Pizza Hut also used dry-mix and pre-baked methods.) Another expert asserted the same was true of tomato paste: Whether it came to stores bagged or canned, consumers could not discern a difference. Better ingredients. Better pizza. In isolation, this was “puffery,” the common advertising practice of making unsubstantiated and subjective claims that consumers are not reasonably expected to take as fact. Pizza Hut argued that by combining the slogan with imagery meant to evoke a sense of having actual higher-quality ingredients or by insisting dough needed time to peak, Papa John’s had tipped the scale over to false claim. Novak must have been beaming as the judge ordered an injunction against their slogan, barring its use in any forthcoming advertising and instructing Papa John’s to recall all materials featuring the phrase. He also ordered them to make clear that Pizza Hut co-founder Carney hadn’t been with the company since 1980. But Pizza Hut barely had time to celebrate. In 2000, Papa John’s appealed the decision, arguing that their slogan was simply an opinion, not a matter of fact, and therefore impossible to be misleading. After all, Pizza Hut often declared it had “The best pizza under one roof.” Was that supposed to be taken literally? Papa John’s won the appeal, avoiding the injunction and having to pay $12.5 million in damages that Pizza Hut was still seeking. In 2001, the Supreme Court curtly turned down Pizza Hut’s petition to have the case heard at the highest level. Today, after years of remodeled pizzas, repainted stores, and endless ad campaigns, Schnatter remains synonymous with Papa John’s advertising; Novak is now executive chairman at Yum! Brands, the new name for Tricon. The company stands as the world’s largest supplier of pies with nearly 15,000 locations and $13 billion in sales; Papa John’s is in third place, with a third of the stores and $2.5 billion recorded annually. Largely brushed aside during the Federal case was the fact that, in 1998, Papa John’s launched a civil suit against Pizza Hut for using that clip of Schnatter and his quote about dough. It wound up being settled out of court. The problem? Papa John’s thought it was misleading.